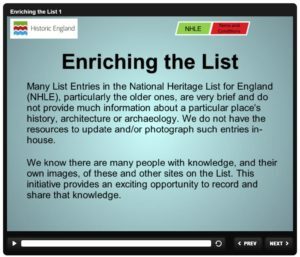 The Historic England (HE) ‘Enrich the list’ programme opens access to information sources that support the management and care of listed buildings and structures, and IHBC members are especially encouraged to share their knowledge and enhance care for our heritage by helping to ‘Enrich the list’. Historic England has listed almost 400,000 properties and places over the years, but with the list growing exponentially it’s difficult for Historic England to give each listing the detail it deserves. You can share photos (new or old), historical events and social history, architectural changes – anything you think will help create a better understanding and help share the stories of our heritage.